Melbourne Water's River Health Incentives Program is assisting in the 2010 planting program. 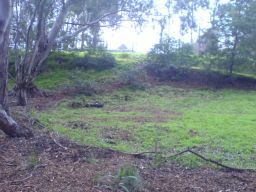 22 December 2010 - David and I slashed/mowed the woodland with his mower and a hired "Billygoat slasher" for fire hazard reduction. - approx 12 + 8 hours work. 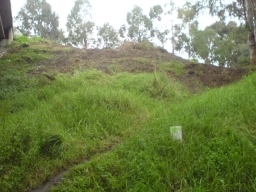 16 December 2010 - Spread a load of mulch on east picnic area slope. - approx ¾ hours work. 10 December 2010 - Community work day - Weeded around picnic area, spread a load of mulch on car park slope, and planted 15 kangaroo apple on slope and in ex-boxthorn area. 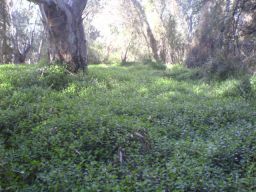 'Cut and painted' woody weeds in 2009 area. Planted 50 ruby salt bush (Einadia nutans) on picnic area slope. - approx 3 hours work x 8. 9 December 2010 - Slashed about east picnic area, area near car park, and ex-boxthorn area. - approx 2 hours work. 6 December 2010 - Slashed about ¼ to ½ 2009 planting area of weeds. Saw blue tongue lizard. - approx 4 hours work. 29 November 2010 - Mowed (with hired mower) grass and weeds in E-F 5&6. Mower had trouble with the long grass - up to 1.8m high. Saw blue tongue lizard, lots of skinks and 2 eggs on the ground - 1 had hatched and 1 whole. Billabong had flooded again with water over the track near the culvert. River level at Heidelberg was 6.1m - approx 5½ hours work. 18 November 2010 - Slashed near car park and east of picnic area. Placed wire guards around some new plantings in this area and weeded ex-boxthorn area. - approx 1½ hours work. 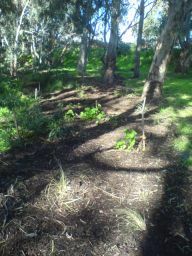 17 November 2010 - Did some weeding of, and spread mulch around picnic area. - approx 2 hours work. 22 October 2010 - Planted about 20 Ozothamnus ferruginious in 2008, 2009 and 2010 areas. Sprayed 1 metre beside bike path along most of the way. Grubbed out some woody weeds. David mowed around the plantings in the woodland. 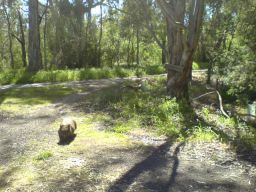 Met a wombat visiting the reserve. - approx 2 + 3 hours work. 6 September 2010 - Slashed part of 2009 area - approx 3 hours work. 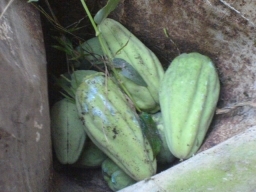 13 August 2010 - Community work day. David, Michael and Russell cleared inkweed and Madeira winter cherry from east of the the billabong. Helen, Felicity, Nina and I weeded and mulched around the picnic area - approx 27 hours work. 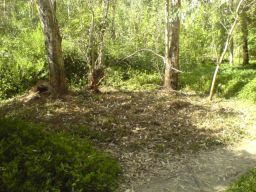 9 August 2010 - Slashed and sprayed the billabong peninsula; before and after photos. - approx 3 hours work. 26 July 2010 - Slashed and sprayed part of the peninsula between the billabong arms (D4 - D5) in the 2010 planting area, and pulled out more Madeira winter cherry, pittosporum, and moth vine with fruit. - approx 3 hours work. 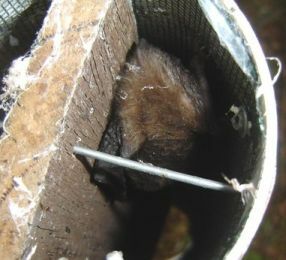 23 July 2010 - Robert Bender checked the microbat which had shifted tubes since last Saturday. It is a male Gould's Wattled bat (Chalinolobus gouldii) and sound asleep (in torpor). 16 July 2010 - Slashed and sprayed more of the 2010 planting area west of the billabong. 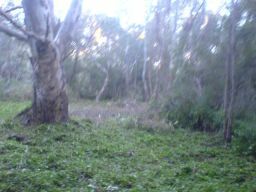 Found and pulled out a small forest of Madeira winter cherry and some pittosporum in the northwest of the billabong. There were a lot of Melocytis dentatus (Hemp bush) and Coprosma quadrifida (Prickly currant bush) with a few Gynatrix pulchella (Tree violet) - approx 3 hours work. 12 July 2010 - Slashed the remainder of the grassy part of the 2009 planting area. Finished slashing and spraying the 2010 planting area southeast of the billabong, and pulled out more Madeira winter cherry and some pittosporum, and moth vine with fruit. Sprayed about 4 - 8 metres into the grassland south of the billabong - approx 3 hours work. 9 July 2010 - Slashed about half of the 2009 planting area. Met Melbourne Water contractors who were preparing the site for the Rapaneas, and they used the last of their Starane on the Trad in the 2009/10 planting area. - approx 4½ hours work. 5 July 2010 - Slashed and sprayed further into the 2010 planting area southeast of the billabong, and pulled out Madeira winter cherry and some pittosporum, and moth vine with about 30 fruit. - approx 3½ hours work. 1 July 2010 - Grubbed out more inkweed in the 2010 planting area east of the billabong. - approx 1 hours work VINC 1800. 28 June 2010 - Slashed and sprayed further into the 2010 planting area southeast of the billabong, and pulled out lots of Madeira winter cherry and some pittosporum, prunus, and moth vine. David sprayed spear thistle rosettes in the billabong. Slashed area east of the picnic area. Chain on the gate had been cut with bolt cutters since 21/6. - approx 4 + 2 hours work. 21 June 2010 - Cut a couple of trees that had fallen across a bike trail. Slashed and sprayed further into the 2010 planting area in C4 - C5 - D5. Slashed nightshade in 2009 area - approx 3 hours work. 28 May 2010 - The hired excavator removed the last of the boxthorn - including the stumps, leaving a bare slope ready for planting. 12 May 2010 - Boroondara delivered a load of mulch. Slashed and sprayed further into the 2010 planting area. Pulled out a 2 small hawthorns in C4 - approx 2 hours work. 6 May 2010 - Slashed east of picnic area and bank west of picnic area. Cut up some old lopped (weed) trees to form a 'garden' bed edging. Placed 2 signs advertising next working bee - approx 1.5 hours work. 3 May 2010 - Slashed further into the 2010 planting area but forgot the backpack spray. Pulled out a sweet pittosporum and small hawthorn in C4 - approx 2 hours work. 28 April 2010 - Slashed/sprayed further into the 2010 planting area and then slashed weeds in 2009 planting area. Pulled out 3 more baby bitou bushes and a sweet pittosporum in D3 - approx 5 hours work. 16 April 2010 - Monthly working bee - Cleared rubbish left by BMX jumps, I slashed the weeds in the 2009 planting area, Helen weeded the picnic area, Bob mowed the picnic area and along the edges of the bike path through the 2008/9 planting area, and David weeded the 2008 planting area. - approx 10 hours work. Found Powerful Owl feather in the billabong. 8 April 2010 - Slashed the picnic area and the area east of the picnic area incl. the box thorn area in preparation for mulching the dead boxthorn. - approx 1¾ hours work. 1 April 2010 - Sprayed parts of the 2009 planting area where the Trad had grown back with .14% Glyphosate with surfactant (40L). - approx 1½ hours work. 25 March 2010 - Continued slashing the west end of the 2009 planting area where the Trad had grown back. 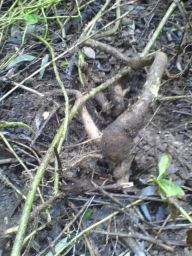 Pulled out 3 Sweet Pittosporum (2m tall). - approx 1½ hours work. 24 March 2010 - Slashed the west end of the 2009 planting area where the Trad had grown back. - approx 3 hours work. 15 March 2010 - I slashed the 'mezzanine' level east of the picnic area and planted 25 Kangaroo Apples on the bank after spraying the bank. 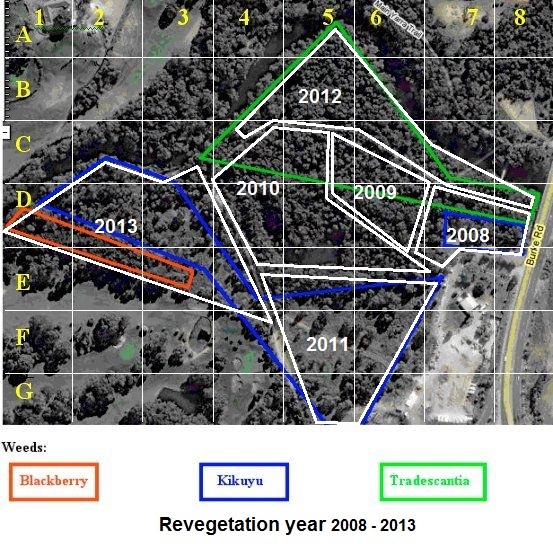 I also slashed the 2009 reveg area. - approx 5 hours work. 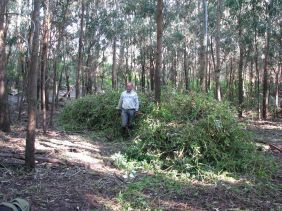 12 March 2010 - Monthly working bee. 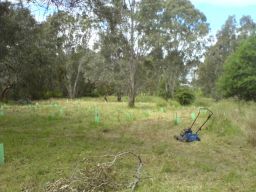 Helen, David & I weeded the 2009 reveg area as there were too many baby redgums and silver wattles to avoid if I had slashed. 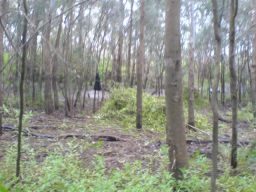 David also removed redundant tree guards, and worked on inkweed, blackberry and spear thistle in the billabong. Helen and I found and removed about 15 small bitou bushes west of the bike path near the golf course. - approx 3½ hours work x 3. 4 March 2010 - Weeded inkweed (Phytolacca octandra) from area east of the billabong. - approx 1 hours work. 1 March 2010 - Finished slashing the 8 January area. - approx 3 hours work. 25 February 2010 - Slashed/sprayed the 8 January area a second time and slashed the Trad in the rest of this block. Poured 100mL petrol down the European wasp nest near this area. - approx 2 hours work. 24 February 2010 - David and I met with MW grants assessor 1¼- Slashed weeds and slashed/sprayed the Trad in the 2009 area and in the NW of 2010 area - approx 2½ hours work. 20 February 2010 - Slashed weeds and slashed/sprayed the Trad in the 2009 area - approx 3½ hours work. 19 February 2010 - Slashed and sprayed the Trad in the 2008 area west of the picnic area and 'mowed' the picnic area - approx 2½ hours work. 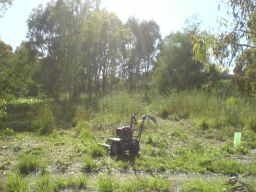 12 February 2010 - David & I surveyed the whole site, removing some spear thistles, bitou bush and other weeds along the way. 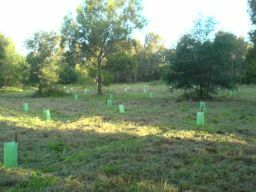 We then removed some tree guards no longer needed and marked some River red gum seedlings in the 2009 area before slashing it - approx 4 hours work *2. 25 January 2010 - Slashed and sprayed Trad in the 2009 area & slashed area due east of picnic area. - approx 3 hours work. 14 January 2010 - Cleared spear thistle in the billabong - approx 1½ hours work. 8 January 2010 - David and I slashed and sprayed Trad in the NE corner2010 area, followed up by clearing spear thistle in the billabong Picture shows an area 1 week later. - approx 3 hours work * 2. 4 January 2010 - Weeded around picnic area, removed some areas of Madeira winter cherry regrowth, slashed along path west of Chris Cross embankment, and sprayed around 2008 & 2009 plantings. - approx 2 hours work.